After three months as the nation's most valuable automaker, a bad week in an otherwise stellar year has knocked Tesla from the top perch as the nation's most valuable automaker. Tesla's growth remains stellar, with shares soaring close to 50 percent this year, twice that at General Motors Co., which retook the spot Thursday. Ford Motor Co. has actually fallen in value this year. But a trifecta of bad news in recent days, starting with a tweet from Tesla CEO Elon Musk, has delivered the worst week for the electric automaker's stock since early 2016. Shares fell 4 percent in midday trading Thursday, pushing shares down more than 13 percent for the week. 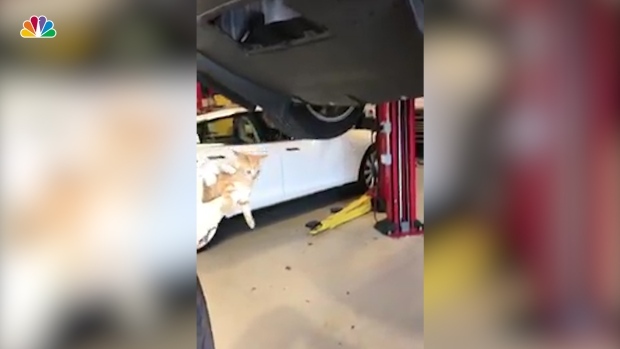 A Florida man heard meowing coming from inside his Tesla. He took the vehicle to his service center where a kitten was pulled from the rear bumper. On Monday, Musk sent out tweet saying that the Palo Alto, California, company anticipates production of 20,000 Model 3 cars per month in December, which was below previous estimates. Tesla also said Monday that it delivered about 22,000 vehicles in the second quarter, bringing first-half deliveries to about 47,100. That's at the low end of the company's projections earlier this year of between 47,000 and 50,000 deliveries. Then on Wednesday, the dynamics of the electric car market shifted a bit when Volvo announced that by 2019, it would be producing only electric and hybrid vehicles, the first traditional automaker to make that leap. Volvo, which is based in Sweden but owned by Chinese firm Geely, will launch five fully electric cars between 2019 and 2021. Three of them will be Volvo models and two will be electrified cars from Polestar, Volvo Cars' performance car arm. 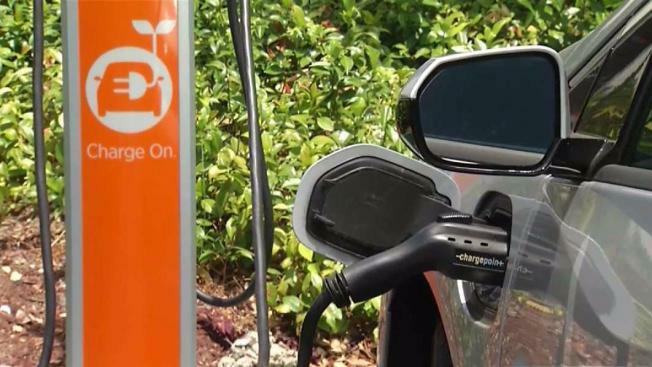 It also plans to offer a range of hybrids as options, expecting to sell 1 million electrified cars by 2025. General Motors is already selling the Chevrolet Bolt, Audi plans to introduce an electric SUV next year. Ford will have one by 2020. On Thursday, one day after the Volvo announcement, the Insurance Institute for Highway Safety said that while Tesla's Model S received an acceptable rating in its small overlap front test, it did not get the Top Safety Pick+ rating that the Lincoln Continental, Mercedes-Benz E-Class and Toyota Avalon received. Overlap front tests gauge the safety of those inside the car when the front driver-side corner of a vehicle hits a tree or utility pole, or collides with another vehicle. The IIHS said that the main issue with the Model S performance was that the safety belt allowed the torso of crash dummies to move too far forward, allowing the head to strike the steering wheel hard through the air bag. IIHS said Tesla modified the vehicle and they retested it, but the same thing happened again. Tesla said Thursday that the carmaker's rating for the small overlap front crash test was the second-highest rating available and that the company received the highest rating in the rest of IIHS's crash testing categories. A Tesla spokesperson maintained that "the most objective and accurate independent testing of vehicle safety is currently done by the U.S. government, which found Model S and Model X to be the two cars with the lowest probability of injury of any cars that it has ever tested." Nonetheless on Wall Street, where Tesla's shares have been unstoppable, investors are taking a breather. Shares of Tesla Inc. slid 4 percent to $315.07 Thursday.